I've been feeling blue lately. Not sad. Just feeling the need for blue in my life. You probably saw my recent blue and white Ikat chair reupholstery project. 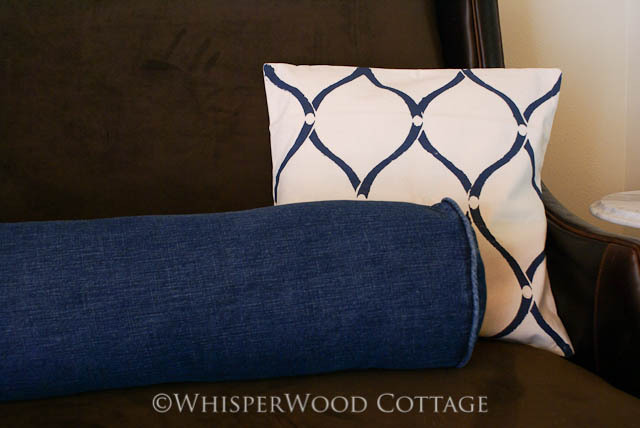 Now, with a little help from DecoArt, Cutting Edge Stencils, Canvas Corp, and Rockler (all sponsors of The DIY Club), I used an hourglass stencil to add a graphic punch of blue to a canvas pillow cover. I was surprised at how quickly the project went. 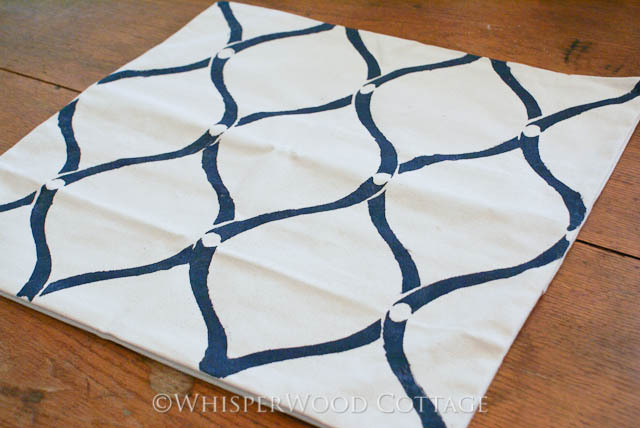 I'm thinking of all kinds of other stencils and paint colors I can use to transform more canvas pillow covers! While I have made pillow covers before (with the help of my dear mother), I love the concept of pre-made pillow covers...saves me the hyper-ventilation that accompanies my attempts to sew! ...to more visually interesting (below). I love the large graphic! It adds a contemporary edge to balance the traditional settee. 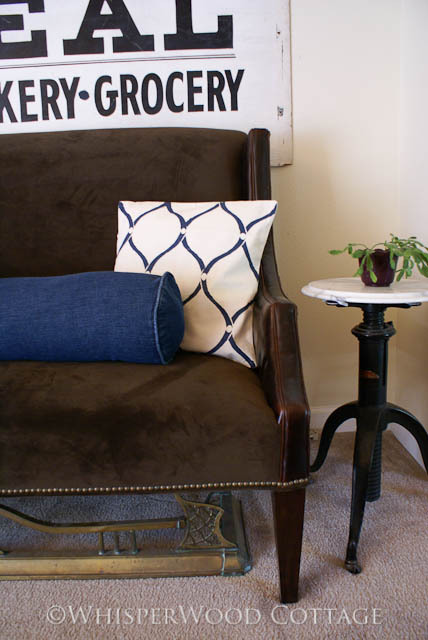 And the blue color is perfect with the denim bolster. It's a happy, eclectic mix! 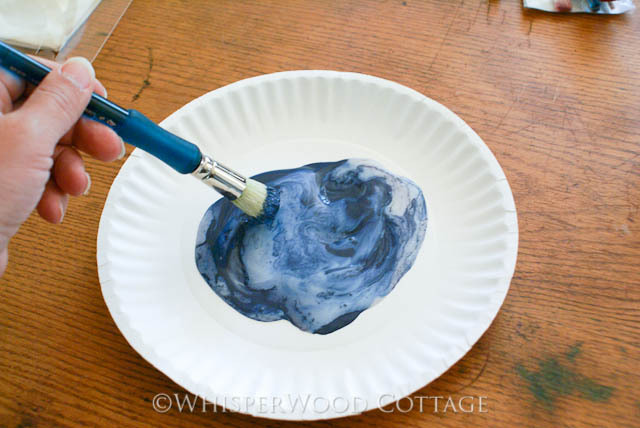 Have you linked up to The DIY Project Party? Gorgeous! I just love denim and the new pillow is lovely! I love it! I really need to get some new stencils. That color is gorgeous. I love stenciling fabric. it is my new way to update anything. Nice work. I cannot believe that is a stencil! 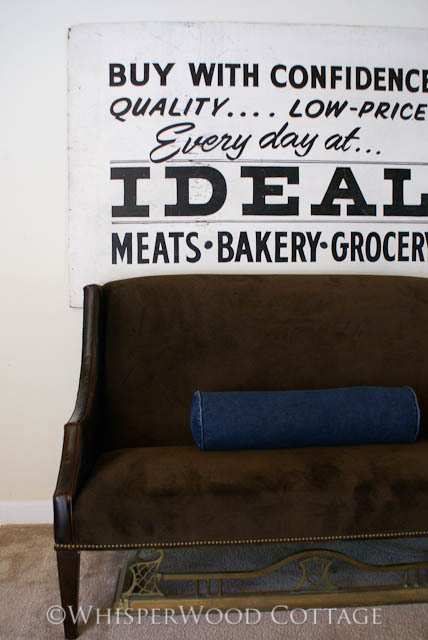 Love the fabrics and the sign and settee ---- great looking vignette. This pillow really stood out to me. It's very modern and fresh. You picked a great stencil and color! I'm loving your pillow! It looks great with the denim pillow. Thanks for sharing @ Catch as Catch Can, and linking back to me. How rich are those colors. I, too, have that denim bolster. Love it! PS. We named the bolster pillow: sausage pillow. How fun is that? It makes us giggle during pillow fights.